Welcome to our Nioh Stats Guide, here we will explain Nioh Stats and what each one does for your character in-game. Everything from core Stats like Body, Agility, Heart, Ki, Spirit and even Amrita. Then we will go into Battle Stats like Break, Parry, Ninjutsu, Onmyo Magic and any other Additional Stats that are available in Nioh. Nioh Core Stats effect the Players character in a variety of ways, ranging from the amount of Ki, Life, the different types of Weapons & Armor you will be able to Equip. Nioh Body Stat affects your Life and Resistance to Poison and Paralysis. Nioh Heart Stat affects your Maximum Ki. Nioh Stamina Stat affects your Maximum Life and Equipment Weight. Nioh Stat, Strength affects your ability to Equip Heavier Weapons and Armor. Nioh Skill Stat affects your ability to Equip Technical Weapons and Armor such as Dual Katanas. Nioh Dexterity Stat determines the effectiveness of Ninjutsu and the Capacity. Nioh Stat, Magic determines the effectiveness of Onmyo Magic and the Capacity. Nioh Stat, Spirit affects the power of your Guardian Spirits. Nioh Amrita is the currency used to increase your character’s Level. Similar to Dark Souls franchise players will carry these until they are spent, and can be lost when your die and recovered when picked up near the location of your death in-game. You Should Know: If you die a second time before you have recovered your Amrita from your first Death, they will be lost forever. Gold is the money currency used in Nioh. Nioh Gold is used to do many things within the game. Nioh Levels determine how much your abilities and skills have advanced. Every Level Up in Nioh will allow you to +1 Core Stat and will also award you with Skill Points to be used towards Weapons, Ninjutsu and Oymno Magic. Life also known as Health Points Determines how much damage you can take before you die. Nioh Life Stat is one of the most important stats to pay attention to during fights. If your Life (Health Points) reaches Zero you will die. You Increase You Maximum LIFE by increasing your BODY Stat. You can Recover your life in-game using the Elixer consumable. Ki Energy is used for Attacking and Evasions, Ki will regenerate slowly over time. Nioh Ki Stat is important to pay close attention to since running out of Ki Energy can mean the difference between life and death. You can recover Ki Energy Faster using Ki Pulse. When you run out of Ki Energy you will become incapacitated and vulnerable to enemy attacks for a short time. Nioh Agility determines how agile your movement is. This Agility Stat will vary depending on how much equipment weight you are carrying. The Agility stat affects two major things for your character. Agility affects the distance and speed of your Dodge & Roll. Agility also affects how fast you recover Ki-Energy (Stamina) in-game. Nioh Equipment Weight is the total weight of you equipped items. Equipment Weight affects your agility stat, which in turn affects Ki Energy Regeneration and Character Movement. Nioh Battle Stats affect your Character’s Damage Dealt, Damage Received and how much Ki is Consumed when Attacking/Blocking. These Nioh Stats are mostly found on Weapons and Armor Items within the Game. Nioh Battle Stat, Attack affects the amount of damage you do to enemies with your weapon. Nioh Battle Stat, Defense affects the amount of damage you receive from enemy attacks. Nioh Battle Stat, Break affects how effective you are at breaking the enemy’s guard. 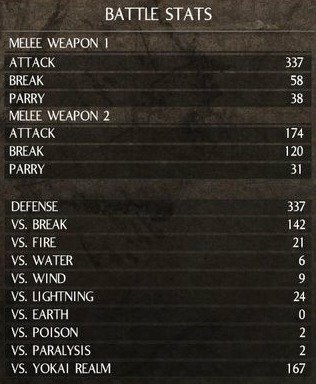 Nioh Battle Stat, Parry affects the amount of Ki lost when blocking enemy attacks. Fire Damage – Damage over time. Water Damage – Reduces Physical Defense and stacks Elemental Build Up. Lighting Damage – Slows Movement and Attack Speed (Chance to Stun). Wind Damage – Reduce break-resistant and parry (Causes Interrupts and Flinching). Earth Damage – Increase Ki Cost. Poison Damage – Fast Damage over time. Paralysis Damage – Prevents Action until effect wears off. VS. Yokai Realm – Resistance to the Yokai Realm, reduces the amount of Ki that is drained when Attacking, Blocking, etc. 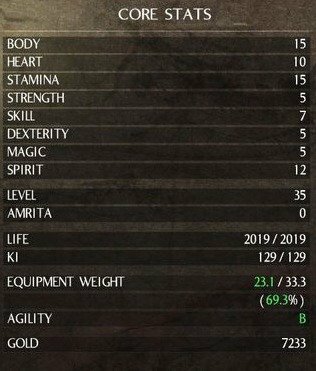 Additional Stats are miscellaneous Nioh Stats, Ninjutsu Capacity and power, Onmyo Magic Capacity and Power and Samurai Skill Points. Along with other useful stats including Guardian Spirit Bond and Ki Pulse. Nioh Stat, Ki Pulse affects how much Ki is restored by performing a Ki Pulse. Nioh Stat, Familiarity indicates how much you have used that Weapon, in turn increasing the stat currently on that specific weapon. Nioh Stat, Guardian Spirit Bond increases the rate your Amrita Gauge fills, used to activate the Living Weapon. Nioh Samurai Skill Points are used to learn additional skills. Nioh Ninjutsu Skills are Weapon based items such as Explosive Powders and Throwing Shurikens. Ninjutsu is affected by the Dexterity Stat. Ninjutsu Power – Affects the Strength/Power of your Ninjutsu. Ninjutsu Skill Points – Points used to learn New Ninjutsu Skills. Ninjutsu Capacity – Affects the amount of Ninjutsu Skills you can have Equipped. Nioh Onmyo Magic Skills are Talismans with varying effects, from weapon enchantments to Ki Recovery. Onmyo Magic is affected by the Magic Stat. Onmyo Magic Power – Affects the Strength/Power of your Onmyo Magic. Onmyo Magic Skill Points – Points used to learn New Onmyo Magic Skills. Onmyo Magic Capacity – Affects the amount of Onmyo Magic Skills you can have Equipped.